Yesterday was our first snow day of the year. All night long I dreamed that it didn’t snow at all. Then my phone rang sometime before 6:30 with the news that school was closed. This was followed by my son presenting with a nosebleed (and blood all over my bed), the cat puking in a high-traffic area (so I couldn’t just ignore it for a while), and explosive diarrhea from my daughter. So, thank God for the snow day, because I did not feel like making lunches and all that after cleaning up those messes. My husband is super busy with everybody’s frozen pipes bursting, so I am on my own a lot lately. Despite the bad start, it was a nice snow day. The boys played outside with their friends a lot and all the kids went back and forth between our two houses all day long. Some guys wanted to shovel our walkway/driveway, so I let them, although I hated to spend the money and I could have used the exercise. I always feel like I should say yes, plus our driveway is reeeeally long. I went out later with my daughter and dug my car out and played with her, which was… joyful. The sun came out, the sky was brilliant blue, the winds were still, and it felt weirdly like spring. On the yard sale front, I sold some dishes and a pitcher (a set for dipping bread in olive oil) ($5), a light-up table from IKEA ($5), and another old guinea pig cage ($15). The big score: I finally unloaded an old riding mower that’s been sitting in our driveway for a while, for $125, via craigslist. I also went through my daughter’s room and found some more stuff to sell. The sale pile is getting quite large, but spring is coming and I figure we’ll just put it all outside at a real yard sale eventually (we have a town-wide one in June, I think). The past few weekends we have been doing the same thing on Saturdays: going to a weekly adoption event at a nearby PetSmart, held by a local shelter, and playing with the doggies. I would so love to pull the trigger, get the back fence installed, and get a dog. The puppies are so cute, and the older dogs break my heart. There’s a 7-year-old puggle there named Riley who must be the jowliest, ugliest dog on the planet. His owner died suddenly 😦 My older son and I love him! But my 10-year-old refrigerator is making weird clanking sounds, so that’s holding me back, among other things. After puppy time, we go bowling with my dad and brother. This started as kind of a joke, but has now become a serious weekly bowling competition. Puppy time is free; bowling is kind of expensive, especially when we order food there. But we’ve enjoyed some other free activities. We all went to a birthday party that was “no presents, please.” That was a fun afternoon at the Funplex — bumper cars, foam ball pit, video games, etc. 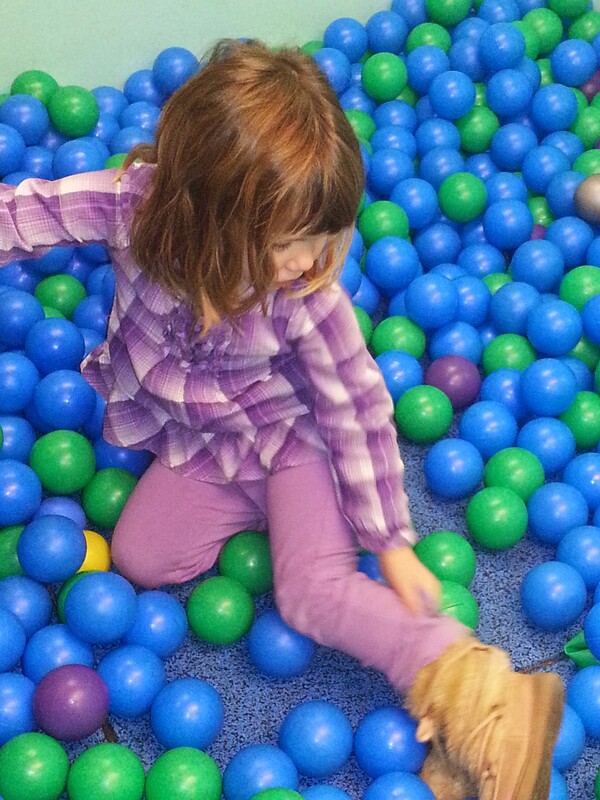 My daughter and I went to the Garden State Discovery Museum courtesy of a guest pass, with my friend and her daughters. That is a great place for little kids — it has all these different areas for make-believe scaled to kids, like a restaurant with a kitchen, a ship with fishing rods, a TV studio, a castle, and so much more. I’ve been doing pretty good with cooking and using up food in the fridge and freezer. I’ve tried some new recipes, like pumpkin French toast bake, which I made this past Monday night for dinner (and ate again for lunch the next day). This past Sunday, I used up some frozen pumpkin to make pumpkin-sweet potato muffins (Jessica Seinfeld recipe), which the kids and I have been eating for snacks this week. My biggest slip-up was on Valentine’s Day Eve. Dang Valentines always sneak up on me. 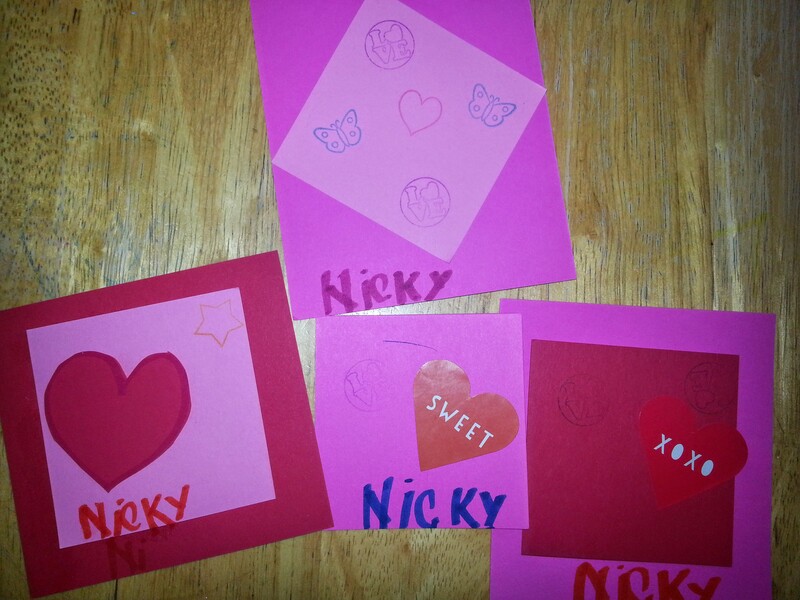 My younger son made all his Valentines, starting a couple of days beforehand. I broke out my stash of little colored square paper, my mom gave us some cute stickers to use, and we had some appropriate stamps in the big box of thrift store stamps. That was fun; he really got into it. My older son said he didn’t want to do Valentines. Ok by me, I said. Then he changed his mind. Luckily, a package arrived in the mail that day from my MIL with some small V-Day gifts for the kids and Valentines for giving out. But — we had no candy to affix to the Valentines. So we ended up at CVS at 7 pm and somehow spent $30 on candy and Gatorade and I don’t know what else. Then, I couldn’t find the list of names for my older son’s class, he spent two hours writing out his Valentines and complaining about it, and then I had to finish them after he went to bed and try to figure out who we were forgetting. BUT — when they both came home with their little mailboxes of cards, candy, tattoos, and selfies, they had fun going through them. So I GUESS V-Day is worth it.